If you have to give a pass to hot or cold drinks because you are afraid they’ll make your teeth hurt, it’s time to talk to your A Plus Dental dentist about the possibility that you have sensitive teeth. And sensitive teeth are not only aggravated by food temperature, other things can affect them, like sweet and sour foods or even rapidly breathing in cold air. To be able to treat tooth sensitivity, it is necessary to know what is causing it in your particular case. Once we’ve determined the cause of your sensitivity, we can work with you to find a solution. In some ways we should be asking, what doesn’t lead to tooth sensitivity? The fact is that our teeth can be sensitive to almost anything we do to them. This includes not brushing enough, brushing too hard, sweet foods, acidic foods, sour foods, dirty teeth, dental cleaning, teeth-grinding, hard candies, etc. This is why good dental care is so critically important – it can head tooth sensitivity off at the pass. The best, cheapest, quickest, most painless treatment for tooth sensitivity is prevention, so keep up the good dental hygiene at home! Teeth whitening or bleaching. It is perfectly normal for teeth to be sensitive or hurt for a few hours after treatment. This sensitivity usually occurs in smaller teeth, like the maxillary laterals or mandibular incisors. This sensitivity should go away within a few days. If it does not, see your dentist. Receding gums. Gums naturally recede as we age. This recession exposes the previously protected dentin. Gum disease has a similar receding effect, which varies in relationship to the particular patient and their condition. Acidic foods and mouthwash. This includes healthy foods such as oranges, grapefruits, and limes. Citric acids burn enamel away, and acidic mouthwashes can further upset sensitive teeth. Brushing too hard is a very common cause of sensitivity. In this case you are working too hard at your dental hygiene. Harsh bristles that cause abrasion, scrape the enamel right off the surface of your teeth. This includes chewing hard candies and ice, grinding your teeth, or failing to protect your teeth while playing sports. When impacts are hard enough, cracks result that expose the nerve endings in tooth pulp. When the nerve endings touch things like food or other teeth chomping down they react with sensitivity and pain. Sugary sodas. The byproducts of sugar, created by hungry bacteria eating the sugar, degrade enamel by softening it, leaving it vulnerable to injury. Low-sugar soda can help, but is quite acidic. The best drink is water! One last thing about causes of tooth sensitivity – If you suffer from it, it is important to visit your dentist to determine what the cause is. Different causes may require different solutions. What Can Be Done About Tooth Sensitivity? Several treatments are available, and which one is just right for you depends on your individual case. Your treatment will be worked out in consultation with your A Plus Dental dentist. And while we do relieve your pain, we also focus on getting to the root cause of the sensitivity/pain. There no single treatment option that works for everyone and if the reason for the sensitivity is addressed, the treatment will be more successful in decreasing sensitivity/pain. Desensitizing toothpaste. There are several toothpastes designed for sensitive teeth. Your dentist may recommend one or you may try different brands until you find the product that works for you. Be sure to use fluoridated toothpaste for sensitive teeth, not tartar-control toothpaste. Try spreading a thin layer of the desensitizing toothpaste on the exposed tooth roots before bed. Avoid grinding your teeth. Consider getting a mouth guard if you participate in sports. Bonding, crowns, or inlays. These may fix a tooth flaw or decay that is causing sensitivity. Surgical gum graft. This protects the root and reduces sensitivity if gum tissue has eroded from the root. Root canal. This is a last-resort treatment for severe tooth sensitivity that has not been helped by other methods. Dental sealants can be applied to tooth surfaces and exposed root surfaces to shield the nerves below them. 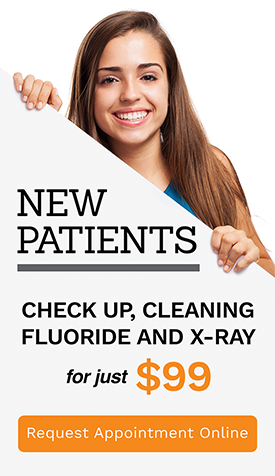 Our goal at A Plus Dental is to provide our Campbelltown area patients, from infants to seniors, with caring, relaxed treatments in a calm and welcoming environment. By choosing A Plus Dental, you have taken the next step to a beautiful, healthy smile with teeth that feel great in your mouth!! With have over 30 years of experience combined and treat each of our patients with the utmost care and respect. Call us at (02) 4627 3833 or request your appointment online today! Sparkling Water – Is It Bad For Your Teeth? Home Technology For Your Teeth! Dental Crowns, How Long Will They Last?